When you travel, you often need numerous documents to get you to your destination. Whether you're simply going through airport security, or you're going through customs and immigration as well, it can be difficult to keep boarding passes, passports, driver's licenses, and everything else organized and accessible. This lightweight but durable deluxe document organizer from Lewis N.
When you travel, you often need numerous documents to get you to your destination. Whether you&apos;re simply going through airport security, or you&apos;re going through customs and immigration as well, it can be difficult to keep boarding passes, passports, driver&apos;s licenses, and everything else organized and accessible. This lightweight but durable deluxe document organizer from Lewis N. Clark helps to keep you organized, even when you have multiple things to keep track of and you&apos;re in an unfamiliar place. With interior and exterior pockets, you&apos;ll have everything easily within reach, and you won&apos;t be scrambling to find documents or money. The external pocket is perfect for boarding passes and passports when you need to frequently access them, and the interior pockets can hold these as well as other travel documents. 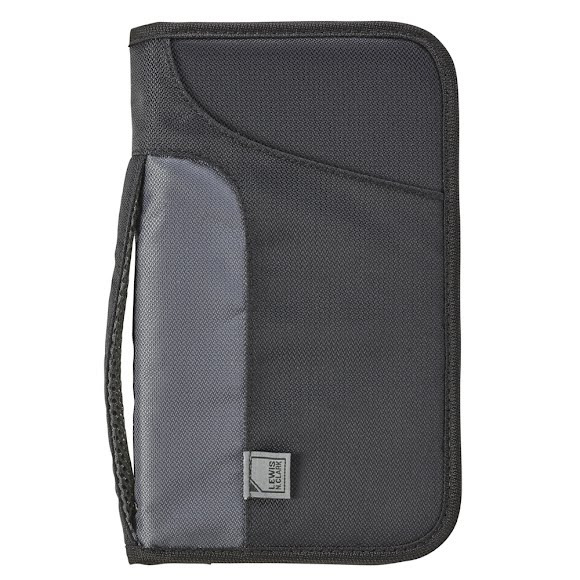 The internal zippered pocket is ideal for coins and the large mesh pocket can hold electronics like cell phones. There is a sleeve for a pen or pencil as well. With multiple RFID-protected slots for credit cards, it can also be used for everyday items such as insurance cards, loyalty cards, cash, coins, paper pads, and more. Whether you&apos;re on the road or at home, it can effortlessly be slipped into a purse, briefcase, carry-on bag, backpack, or any other kind of bag. The zipper keeps everything secure while it&apos;s folded, but you can also unzip it so that it lays completely flat. This deluxe durable document organizer keeps everything in one place so you can easily access your belongings at a moment&apos;s notice! Outer open pocket for boarding pass, phone, etc. Dimensions Closed: 9" x 5.5", Open: 9" x 11"